It's been a crazy week for DC movie news, but easily the biggest thing to come out this week is that Warner Bros. is currently working on a Joker Origin Movie that will take place outside of the DCEU. Todd Phillips (The Hangover) is set to direct with filmmaking legend Martin Scorsese set to produce. There is no word yet on who is going to portray the clown prince of crime in this movie, but it isn't going to be Jared Leto. 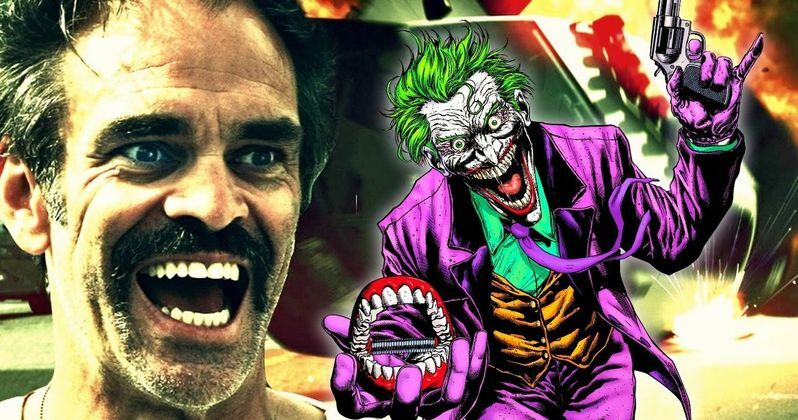 Today, The Walking Dead star Steven Ogg has thrown his hat in the ring. Steven Ogg recently spoke with Cinema Blend in honor of The Walking Dead season 7 Blu-ray/DVD release. During the course of the conversation, he was asked whether or not he'd be up for playing the Joker in a future DC movie and he was more than open to the idea. Specifically, he wants in on this Joker origin movie. Here's what he had to say about it. "It'd be fun. I mean, it seems to screw everyone up, whoever does it. They end up going a bit crazy, except if you look at Nicholson's Joker. But what I was reading, and I'd love to do it, is the younger, like 'how The Joker became The Joker' is what they're working on. So I'd assume it would be a younger person. But that type of character, there certainly would be a lot of interesting things to explore with him. I would love to do my own different take on it, on him. So yeah, if you're offering it to me, I'll take it." Steven Ogg is probably best known for his role as Simon, who plays the right-hand man to Jeffrey Dean Morgan's Negan on The Walking Dead. He is also known to the video game community as Trevor Phillips from Grand Theft Auto V, which proves he can handle the level of crazy required to play the Joker. He may not be a huge name, but when looking at his resume, he seems like the kind of guy that could pull something like this off. He's already doing well on one comic book adaptation. Why not give him a crack at another? As it stands, Todd Phillips is currently writing the script for this Joker origin movie with Scott Silver (8 Mile) but Warner Bros. hasn't set a release date. Even though Jared Leto won't be appearing in this movie, the actor did recently clarify that he will be continuing to play the part in the DCEU moving forward. Currently, he is slated to appear in Suicide Squad 2, which was just put on the fast track, and the recently announced Joker and Harley Quinn movie, which is said to be taking the place of Gotham City Sirens. So there is going to be quite a bit of Joker headed our way over the next few years. Heath Ledger remains the definitive version of Joker on screen for his amazing performance in The Dark Knight, but at least one more actor is going to get the chance to make their mark as the famed Batman villain on screen. Will it be Steven Ogg? Likely not, but you never know.